After successfully completing two-phases, traversing through 11 states, top civil rights network National Alliance of People’s Movements (NAPM)-sponsored Samvidhan Samman Yatra began its third phase this week from Jharkhand. Travelling through Odisha, West Bengal, Assam, Meghalaya, Nagaland, Bihar, Uttar Pradesh, Delhi, Haryana, Punjab, Jammu & Kashmir, Himachal Pradesh, and Uttarakhand, it will culminate in Delhi on December 10, International Human Rights Day. At several villages, including Malhar Toli, Ramgarh, Badakagaon, Ranchi, Nagri, Ulihatu, Khunti, Angrabari, Lachragarh and Simdega, participants listened to people’s, especially tribals’, plight -- forced displacement, starvation deaths, industrial pollution, imposition of aadhaar-based direct benefit transfer, atrocities in adivasi areas, and other human rights violations. At Malhar Tola, Basant Kumar Hetamsaria, NAPM convener, Jharkhand, told activists how villager Chitaman Malhar had died due to lack of food security and a complete failure of social welfare schemes in the village. The village represented the true face of the state government, he said, pointing out that very few people have been covered under any social welfare schemes. Majority of families do not have ration cards, National Rural Employment Guarantee Scheme (NREGS) cards, pensions etc. Fact-finding organised by NAPM suggested that the death of Malhar was not due to his inability of availing social security schemes but complete failure of administration and neglect towards people by the state, he added. Prem, Chitaman’s son, told activists that the death of his father was due to hunger. The state government tried all means to subvert the reasons. Soon after his death, officials rushed to the village and distributed ration cards to a few families. “We are facing starvation since long but no government official ever paid any attention to our village”, he added. At Badkagaon in Hazaribagh district, which is the epicentre of intense land struggle in the coal-rich state, activists visited the families whose members were gunned down two years back. 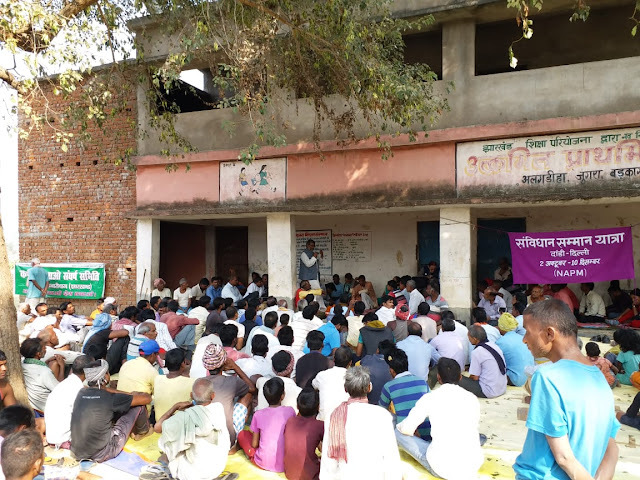 Mithilesh Dangi from Karanpura Bachao Sangharsh Samiti said their struggle is to save land and livelihood of 295 villages, which are endangered by coal mining by the National Thermal Power Corporation (NTPC) and other corporations. Aloka Kujur said, since 2017, the authorities have become hyper actively, creating an atmosphere of terror. The state came down heavily on the Pathalgarhi movement, whose activists write down their constitutional rights on stone and place them at important places in villages for awareness and assertion of rights. Fr Stan Swamy added, the authorities were calling Pathalgarhi movement a criminal conspiracy. More than 3,000 adivasi youth are behind bars when they stood for their rights and development in their area. At Lachragarh village, where an 11-year old girl, Santoshi died of starvation because her family was denied ration after making aadhaar mandatory, Taramani, a Right to Food Campaign activist, said that she had been raising the issue of starvation deaths in the area since long time with the district administration but the government did not respond in time. Santoshi would have been alive if they would have listened to her. 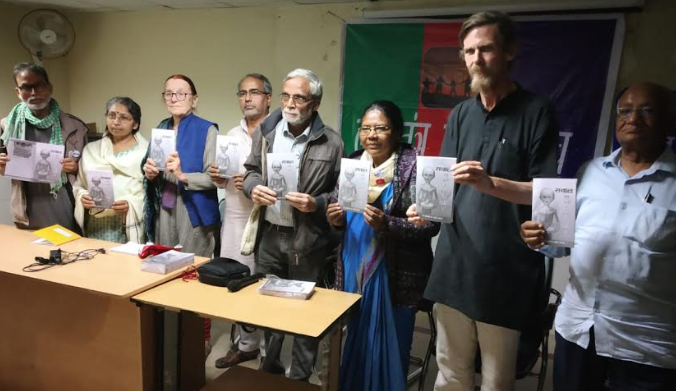 At a public meeting at Satya Bharti, Ranchi, NAPM released a book edited by Hetamsaria on hunger deaths in Jharkhand in the presence of well-known activists like Fr Stan Swamy, Jean Dreze, Dayamani Barla, Aloka Kujur, Gabriele Dietrich, Suniti SR, Rajendra Ravi, BS Rawat, Meera Sanghamitra and others. Briefing the gathering, Hetamsaria said that there have been more than 61 deaths due to hunger since 2015. Among those 18 has taken place only in Jharkhand. “Hunger deaths are an issue across the nation and not just in Jharkhand. It is a failure of the government. Almost half of the deaths happened as their ration cards were not linked to aadhaar and other technical issues. It is also a failure of society, where we see in one case that a dalit person died due to hunger”, said Prof Jean Dreze, well-known economist and social activist.